I tried this North Indian style snake gourd sabzi (padwal sabzi / chichinda sabji in Hindi) for the first time following Kabita’s kitchen YouTube video. Usually North Indians make Padwal sabji by adding chana dal or by stuffing padwal with spicy masala. But this chatpata padwal sabzi given by Kabita was quite interesting and easy to prepare too. So I tried it as a side dish for rice and dal fry. It was a lovely combo. More than the taste, I loved the look of this snake gourd sabzi. Its color and flavor made me drool over it. In the original recipe, Maggi taste maker or maggi spice cubes is recommended to use for enhanced flavor. But I couldn’t use any as I din’t have it in hand. Still it came out well and tasty. Friends, do try this North Indian style snake gourd sabzi recipe for rice and roti. You will love it ! 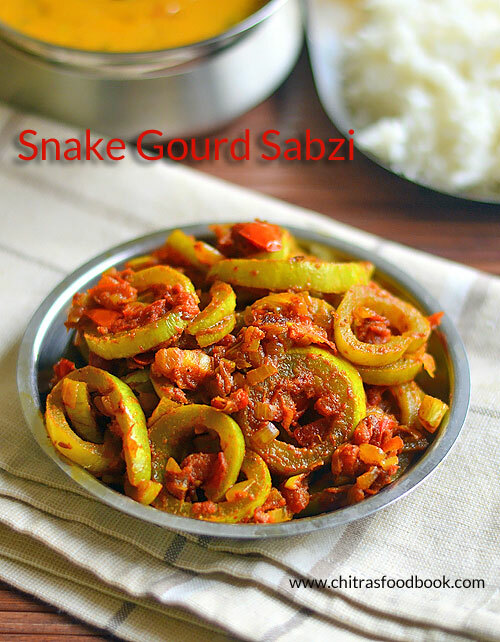 Lets see how to make North Indian snake gourd curry / padwal sabzi with step by step pictures. Check out my South Indian style snake gourd poriyal , snake gourd pepper fry, snake gourd chana dal kootu for rice if interested. Wash and deseed snake gourd / Padwal / Chinchinda. Chop into round slices. Wash and chop onion, tomato finely. In a kadai, heat oil and splutter cumin seeds. Add finely chopped onion and saute till transparent. Add finely chopped tomato and saute till mushy. Add the required salt. Add turmeric powder, red chilli powder and Maggi masala. Saute for a minute. Cover and cook in low flame. Now add chopped snake gourd. Mix well. Cover and cook in low flame foe few minutes. Open and stir whenever needed to avoid burnt bottom. Sprinkle some water to cook if needed. After the snake gourd is cooked and shrunken, switch off the flame. Garnish with coriander leaves. Serve hot with rice and chapati. Wash the snake gourd. Trim both the edges. Insert a knife in the middle and remove the seeds. Now snake gourd looks like a hollow tube. Chop into roundels as shown in the picture below. Wash and chop onion, tomato into fine pieces. Heat oil in a kadai. Splutter cumin seeds. Saute garlic cloves. Then add finely chopped onion and curry leaves. Saute till transparent. Add finely chopped tomato, required salt and saute till mushy. Mix well. Now add turmeric powder, sugar, red chilli powder and Maggi masala powder or garam masala powder. Mix till raw smell leaves. Sprinkle little water. Cover cook for few minutes. Lastly add the sliced snake gourd. Mix well in medium flame till it shrinks a bit. Lower the flame. Cover the kadai with a lid. Cook for few minutes. Mix once or twice in the middle to avoid burnt bottom. You can sprinkle few tbsp of water if you feel the mixture is dry. Cover and cook till snake gourd becomes soft and shrinks well. It takes 10 to 15 minutes in low flame for proper cooking. Make sure onion, tomato mixture is coated well. Switch off the flame and garnish with finely chopped coriander leaves. 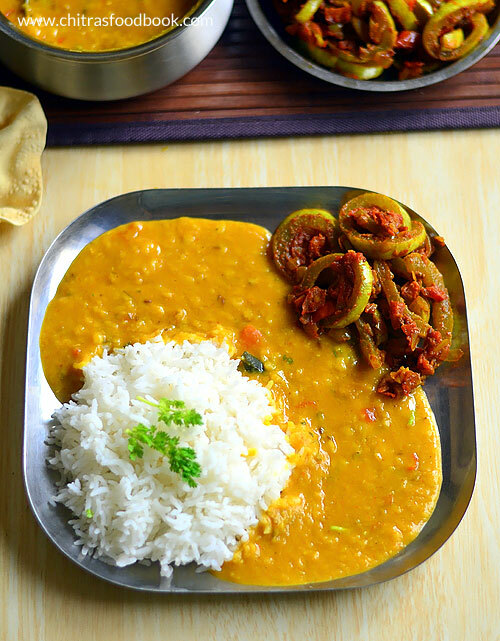 Serve with rice and chapati. Enjoy ! If you skip Maggi masala powder, you can add garam masala powder or kitchen king masala powder. Addition of sugar helps to retain the green color of snake gourd. 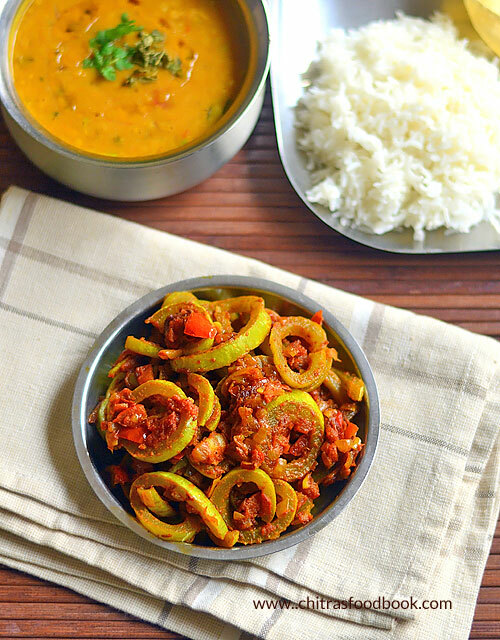 Try this easy, North Indian style snake gourd sabzi for rice and enjoy !